Deputy Defense Minister Eli Ben Dahan on Sunday praised a controversial decision to cancel a program for IDF soldiers to volunteer with the children of migrants and asylum seekers in Israel, saying the predominately African community in south Tel Aviv does not need to be helped. “There people have infiltrated into Israel, taken Israelis’ jobs and made south Tel Aviv an impossible place to live,” Ben Dahan charged. Ben Dahan, who has previously made racially disparaging remarks about Palestinians, went on to question whether if the ban would earn the same backlash from left-wing Israelis if the program were based in the West Bank settlement of Yitzhar. “Israeli soldiers should volunteer for programs that benefit Israeli citizens,” the deputy minister said. Pressed by the interviewer about the Jewish commandment to “love theger [stranger] in your midst,” Ben Dahan said the edict only applied to gentiles who embraced Jewish sovereignty in Israel. Earlier on Sunday, Defense Minister Avigdor Liberman ordered an ene to IDF soldiers working with Elifelet, an organization dedicated to help migrant children in south Tel Aviv, following complaints by local residents and right-wing activists. A report by Channel 10 last week showing a number of Military Intelligence soldiers volunteering with the NGO Elifelet sparked complaints by some Jewish residents of south Tel Aviv neighborhoods — who have long complained of the influx of poverty-stricken, mainly African foreigners in their neighborhoods — who voiced anger at the soldiers’ actions, accusing them of effectively working for a “radical left-wing” group and backing illegal immigration. Israel has in recent years sought to limit the migrants’ numbers. It has built a fence along the border with Egypt, a once-common migration route, and sent many migrants to a desert detention facility — and in some cases back to third-party countries in Africa. Many say they are fleeing conflict and persecution and are seeking refugee status. Israeli officials contend they are economic migrants, and have resisted calls to recognize them as refugees. 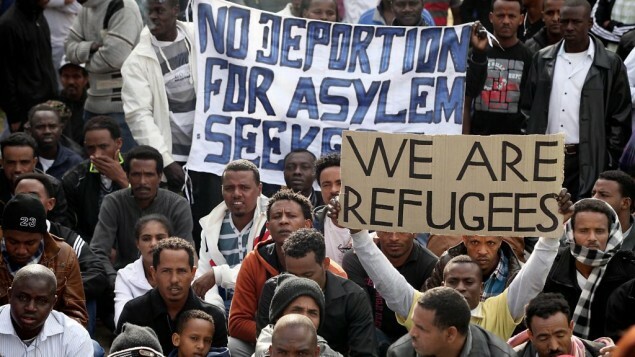 Between 2009 and 2015, 2,408 Eritreans requested refugee status in Israel. The state has responded to 1.42% of these requests, or 45 people, rejecting 40 outright and granting temporary protection to five, while the Interior Ministry granted refugee status to four people. Israel’s approval ratings for refugee status are drastically lower than international levels. 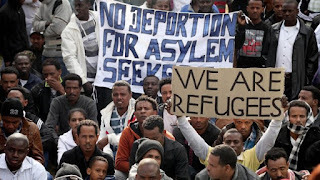 According to the United Nation’s High Commissioner for Refugees, internationally, 84 percent of Eritreans and 56 percent of Sudanese asylum seekers received either refugee status or extended protection in 2014.